Underdog Football Team Shines In 'Undefeated' In 2009, volunteer coach Bill Courtney led Manassas High School's struggling team to the playoffs. 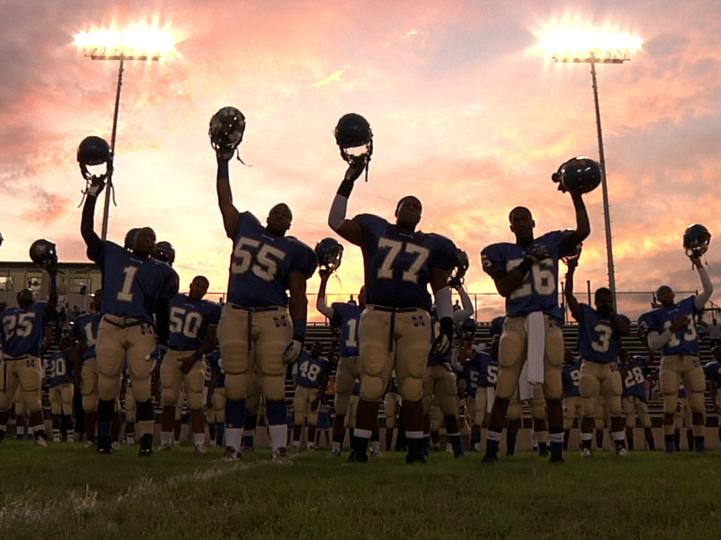 Filmmakers Dan Lindsay and T.J. Martin chronicle the challenges of the Memphis team — on and off the field — in the Oscar-nominated documentary Undefeated. Filmmakers Dan Lindsay and T.J. Martin spent nine months in North Memphis, Tenn., with the Manassas Tigers. Throughout it's 110-year history, the Manassas High School football team in Memphis, Tenn., was known as a losing team. In 2009, volunteer coach Bill Courtney led the struggling Manassas Tigers to the playoffs. Filmmakers Dan Lindsay and T.J. Martin follow the team's 2009 season in the documentary Undefeated, which has been nominated for an Academy Award in the documentary feature category. The film focuses on coach Courtney and three of his players as the Tigers overcome a legacy of losing on and off the field. Lindsay and Martin spent nine months in North Memphis — from July 2009 to April 2010 — attending every practice and getting to know the community. "We would shoot ... talent shows," Lindsay tells NPR's Neal Conan, "knowing that it wouldn't necessarily make the film, but we really want to earn the trust of the Greater North Memphis community. And we were really fortunate to have some really amazing things kind of transpire in front of the camera." The filmmakers shot the film themselves and followed the action with two cameras. They collected 500 hours of footage. "Not recommended," Lindsay says, "if you're going to edit your own film." While embedding with the community and getting an abundance of footage was key to making their "intimate coming-of-age film," it also meant that many moments couldn't make it into the documentary. "[Coach] Bill likes to say there's a story under every helmet," says Martin. "There are some really amazing, really compelling story lines that we just, unfortunately ... left on the cutting floor." Lindsay says the aim of the film was to tell a story that is a lot bigger than football. "Hopefully, when audiences see it," says Lindsay, "they realize that ... football is the lens that ... we enter the story on, but it's definitely not what the film is about."